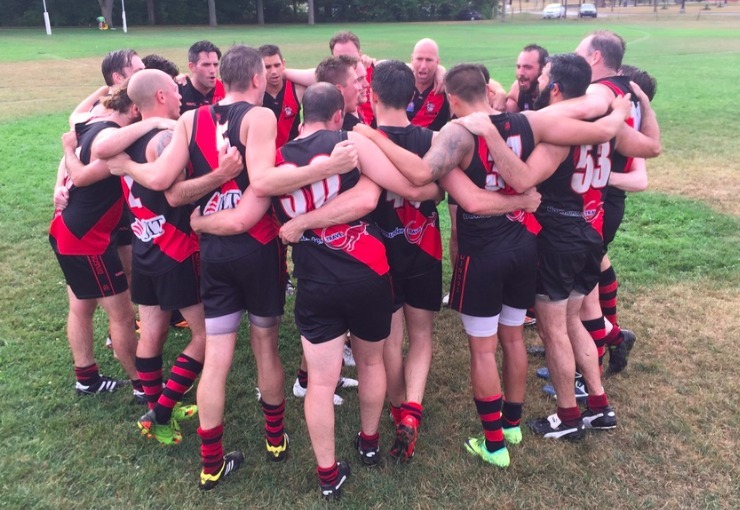 The Dingos have defeated the Toronto Eagles by 29 points to strengthen their chances of qualifying for the 2016 AFL Ontario Finals. In a match that began in a torrential downpour and had to be delayed due to nearby lightning, the Dingos dominated the Eagles around the ground and at the contest to improve their record to 6-4 with two rounds remaining. Coming up against the premier ruckman of the competition, Everett Wells worked hard to nullify the influence of the Eagles' Neil Casey. Dingos' midfielders Michael Ladd, James Duggan and Steve Speers worked hard to win the majority of clearances and gather plenty the ball around the ground, while Tom Humphries ran all day in his first match of the season, also kicking the first goal of the match from a tight angle. Rookie of the year candidate Thomas Santibañez-Espinosa added five of the Dingos' seven goals, bringing his personal tally to sixteen in just six games. He broke the game open in the second quarter, kicking two quick goals and helping the club into the half-time break with a strong lead over the Eagles solitary behind. The Dingos backline was a near inpenetrable force all game, led by second-year Canadian Mike Bocian, who held Eagles' star Aaron Falcioni to just one goal. Sean O'Reilly shut down the Eagles' other key scoring threat, dominating him in the air and keeping his feet when the ball hit the ground to ensure that he was able to gain first possession and dish it off to the likes of Dane Roberts and Dan Gunn who provided constant run off of half-back. The Eagles mounted a late charge that saw them get to within two goals, but a steadying goal to Mike Karas followed by another two to Thomas saw the Dingos run out comfortable winners. 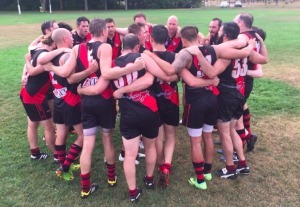 Next up, the Dingos look to lock in a finals berth against the Central Blues at 3pm on August 20th at Humber.